Coming March 2013 Coach Don will be offering a new certification professional Coaching. More than 12 years of Executive coaching and training Coach Don will be teaching “Accelerated Conditioning”™ a new form of coaching to help clients propel the life, business and career. Coaching is actually a method of instructing, directing, and training people in order to develop specific skills and help them achieve their goals. There are different types of coaching which are life coaching, business coaching, and career or executive coaching. Each of these types of coaching applies to various needs that are identified by the person themselves, or by coaching experts. Coaching aims to assist a person in achieving his/her personal goals in life. Moreover, several methods are used in life coaching just to ensure that goals are achieved. There are no standards as to the specific method to use, as long as it works for a certain person. On the other hand, business coaching is solicited by individuals or group of people in the business world. This type of coaching is considered as the method of providing support and feedback to people to help them recognize and realize the effectiveness of their business ventures. Most specifically, business coaching is proven to instill certain work behaviors and attitudes like teamwork, accountability, communication, goals setting, sales, and strategic planning among others. Finally, the most demanded coaching which is the career or executive coaching deals with the practice of helping individuals draw out their career paths. Executive coaching is very important because a lot of people nowadays do not exactly know which career to pursue, and how to succeed in it. Moreover, there are even more people who already have careers, yet are not happy or content. Furthermore, there are also other people who seem to have stagnated in their careers and remained in the first position that they were in many years ago. If anyone experiences any of these situations, then there is certainly a need for coaching. In executive coaching, you will be asked to assess yourself and find out what you really want to do in your life. This is indeed very critical because this determines your direction in the future. Consequently, you would not want to waste your time and your life in a career which might not be what you want after all. Choosing a career path and determining the steps that will help you succeed in this chosen career are dealt with in executive coaching. There is practically nothing to be ashamed of in soliciting for the services of executive coaching. Hiring an executive coach is practically the starting point of taking control of your career. Don Martinez has operated on the philosophy that “People” are the most important asset and are the core of today workforce. As the economy changes so do people, as a person that operates on the values of self development it’s our mission to help shape the lives of people for tomorrow and the future. It’s every aspect of how we do business at the Advantage Coaching Network – from the beginning after opening our doors each and every career seeker contacts us due to their lack of frustration, or misconception of the job market. The large advantage we bring is more than 25 years of expertise in career management and development. We believe that we have two types of people. Ones that know what they want and get it and those who leave their careers to chance only to fall short of achieving their goal. I have discovered that everyone no matter who it is can use help and by taking advantage of hiring a coach they will place them in a position where they can contribute, grow, and ultimately succeed. I firmly believe that you’re most valuable resource as a career seeker is “YOU”, and that’s when you go on an interview you are indeed selling yourself. I also believe that what you put into any endeavor is what you will get out of it. Since our inception, Coach Don has invested time, resources, and faith in our most valued asset – you, the candidate. If you take the time to use are programs the comprehensive tool I believe you will reap the benefits of an exciting and prosperous career. Think you have what it takes to be a coach? Then come join me and my ambassadors of coaches. Recently we conducted a survey of 200 top Fortune 200/500/1000 organizations. Stop and think for a minute who are these individuals (Hispanics) leaders in the C-level Suit? Chances are you will not have to think too hard. As one of the fasted growing consumer markets (Hispanic Markets) the C-level Suite still consist of White middle aged males. In the recent years due to the election of the First Black man to sitting in the white house, we have seen an increase of color (Blacks) being places in key roles within top organizations across the country. Are these appointments a token to show their support for our President? What happen to our Hispanic leaders? We have seen an increase of positions within the c-level suite but very few have been available to Hispanic executives. The reason Mr. Chairman is that Hispanics are a very different breed you have to consider a few factors. One they are not looking for a job? And two they are loyalty to the companies they work for. The Hispanic Culture is one that comes with set of high values, when you look at our parent’s work ethic, for example my parents worked for their employer for 40 and 38 years. My Mother for example spent 40 years with the same company. Today we have three generation of family that has worked for the same employer which brings these to a total of 65 years of combined service. 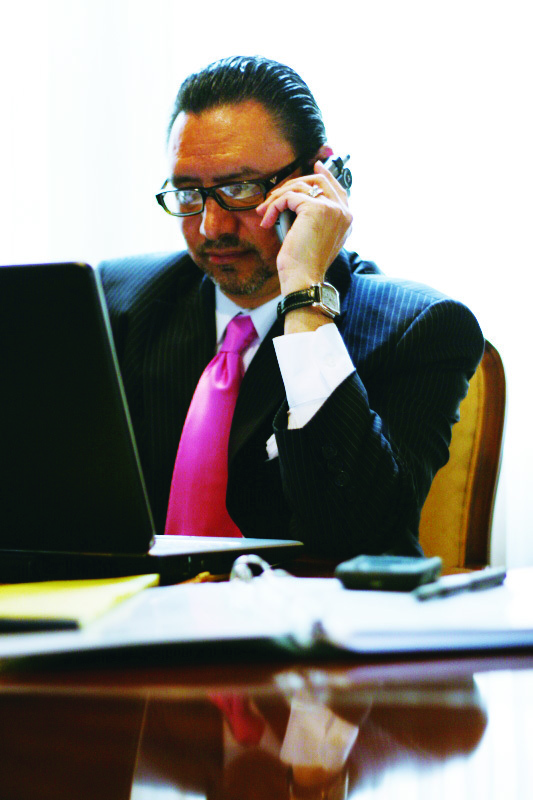 As a Retained Search Firm the Domar Group, Inc is among a small group of firms that represent Hispanic Executives. The talents a major of corporations look for do not answer want ads or job Boards. In 2008, a study found only seven Asian, seven Latino/Hispanic, and five black CEOs in the Fortune 500 companies. Twelve were women. Today these numbers have increase for Blacks due to President Obama taking office. According to the U.S. Census reports, Hispanics will make up about 60 percent of the nation’s population growth between now and 2050, which means that Hispanics will continue to drive the growth of our nation’s labor force in the coming decades. What this means is Organizations need to do a better job of asking for help from Firm such as The Domar Group, Inc.
For businesses struggling with diversity issues, Don Martinez offer Diversity consulting and strategic planning for organizations seeking to embrace Diversity within the c-level suite and within the organization. We have a network of top Hispanic executives ready to explore career opportunities. If you are a Hispanic executive that has a strong desire to run a company or be a part of the C-Level suite or BOD register with us today at avillanueva@domargroup.com Attention Alexandra Villanueva. We are looking for the best of the best of Hispanic multicultural talent seeking to find their place within the Executive Suite. Get started and register to be part of our stable of Hispanic executives. Ace your Interview every time! The subject of interviewing has become a hot topic. Most people are trying to figure out what has changes about finding a job. Companies are tiring to find people that walk on water, well its very well possible that these people exists the problem with this is you have not discovered the secrets to being selected. As an executive career coach I have been retained by high performing individuals that faced being laid off or were considering making a career move. In one of the toughest time to make a career move I have worked one-on-one with individual to get them to the front of the line. With a unique design method and process we helped more people get noticed and hired. Are you among the thousands of applicants that have faces being rejected and turned down time after time? Are you feeling frustrated? Wondering if something might be wrong with you? Rejection is the number one response we here from job applicants. But after attending Interviewing with Power ™ then discover a new set of skills and tools to get them the results they desire? What is your career and life worth to you? Are you prepared to make an investment in you? Are you not worth the money? I can honestly tell you that if you are thinking I can’t afford this right now Don, Then my advice is to continue doing what you are doing and then go back and alter your resume with the title of Consultant Are you sick and tired of being turned down? Are you feeling depressed? Then you cannot afford to miss this session. Don believes if you continue to do the same things you will get the same results. Let Don Teach you how to design the right plan for you and your career. Don Martinez a career development expert touches on how individuals can develop a solid game plan for career success. 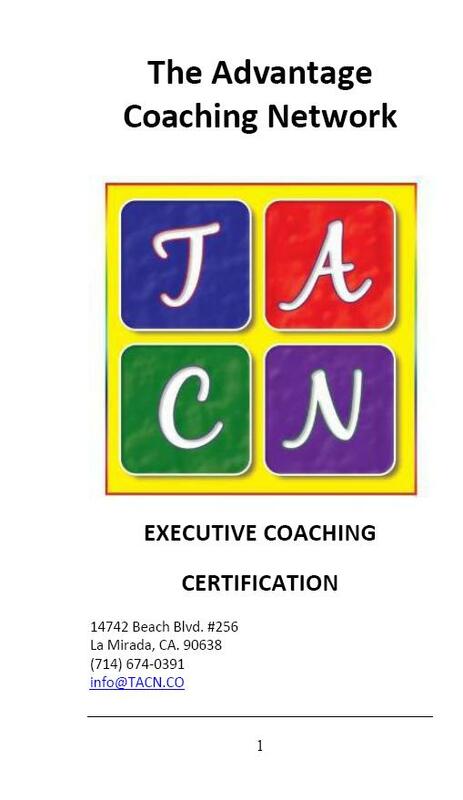 Rank one of the Top 5 Executive Coaches in Orange County Ca. I’ve written this recommendation of your work to share with other. This is great news, in a time when small business owners are seeking to bounce back, this is a start but we don’t need money we need Business and Contracts. (Statement that comes from Small business owners in the product and service industries) What is the NSBA doing to address procurement opportunities? It’s my option that we need to improve business relationship with major corporations by educating them on the importance of working with Small business owners. It would appear that our government (President Obama) might look at an incentive for corporations to utilize working with Small business owners. Do you want to improve your relationships and engage with others more elegantly; or be better able to use language to influence, motivate and generate creative ideas? Neuro-Linguistic Programming (NLP) can help you to achieve this – and more. This article gives you a flavor of what NLP is about, and a few different examples of how you can use it. NLP is a set of advanced communication skills. These have been identified through the study of top performers – those who are excellent at what they do. By understanding and replicating (modeling) their thinking and behavior patterns, this approach argues that you can achieve the same positive results. The tools, techniques and strategies derived from these studies help you to understand yourself and others; how you act and react in the world; how you and others communicate; and how you can easily gain rapport with others to realize positive outcomes. To better understand NLP, remember the last time your boss called you into his office after you finished a difficult project. Or, recall how you felt when you stepped on a stage or delivered a presentation. Or think about how a child reacts to a parent’s angry or frustrated tone of voice. In such situations, reactions are often automatic and can occur without conscious thought. These instinctive reactions may be positive and useful, but they can also be negative and unhelpful. You are the center of NLP’s activity. Any NLP intervention is focused on you and getting you to achieve the best results. These are the guidelines of NLP, ideas and beliefs that are taken for granted. The relationship established is crucial to achieving the right results. Any NLP intervention focuses on an outcome. Acquiring information from the other person is also essential. This high impact seminar focuses on helping individuals take control of their net career leading them to gaining control and receiving success in your next Interview. Most people keep doing what they are doing creating the same results only to learn this is not good enough. Don’t leave your career to chance. A high number of Dons Coaching Clients will tell you that my program is a must attend, For the first time you can be one of the top 10 percent of individuals that made the decision to invest in your career. We know that the job market is tight and competition is high. 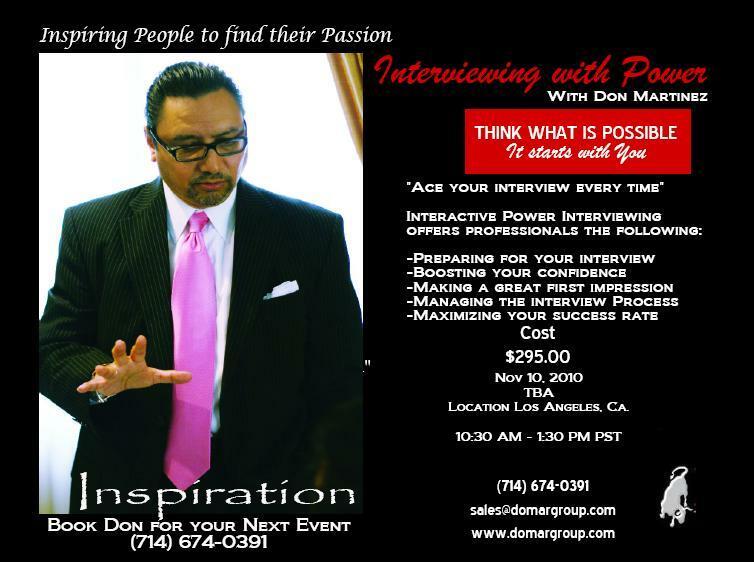 Don Martinez a Career Expert is presenting an Interactive Interviewing Training called Interviewing with power, a workshop that empowers professionals, at all levels, with the skills to present dynamic and impactful interviews, designed to leave a great impression and to influence decision makers. Attend this workshop and learn some of the top strategies in gaining a winning advantage of finding new career. Mr. Martinez is available for hire. Employeer downsizing Let Don Martinez help your employees get back on track. An executive coach is like a personal trainer for your business and your life. What improvements would you like to see in your ability to be at the top of your game. Are you a Professional that see more for yourself, Need someone to push, train, motivate and develop you to live at your best in life in business. How much would you be willing to improve your talents, to become the champion you set out to be. 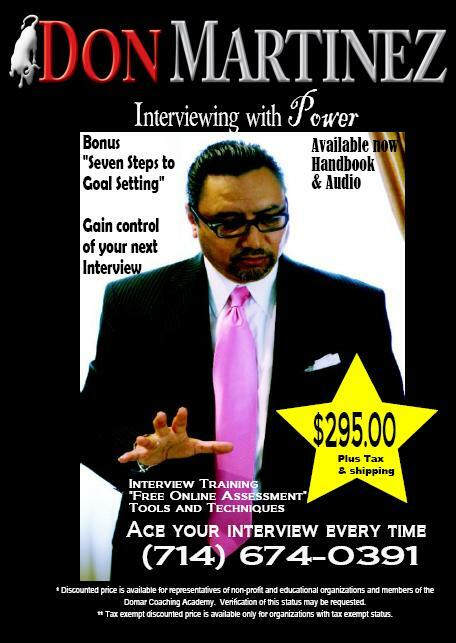 Hiring Don Martinez as your personal coach will work to condition you to be at the Top of your Game.? Expertise: Your coach’s expertise and perspective can help you make more money, make better decisions, set and meet the best goals, and restructure your professional and personal life for maximum productivity and personal satisfaction. A cost/time effective alternative to competency development compared with the more traditional approaches. Executive coaching doesn’t take you out of your office for large blocks of time. It targets your specific needs and helps you implement changes step by step. If you are someone seeking to advance your career, get a promotion, change jobs or make more money don’t just think about it. Call today and explore your options for super career success. What do you have to loss? Make the inventing in you today. People don’t plan to fail they fail to plan. In sports the player doesn’t show up thinking they are going to loss the game, if they did they were better off not showing up. Get in the game and Let us help take control of your life and career.